When the northern lights – Aurora Borealis are strong and bright, get ready for the show of your life as the lights dance across the sky from horizon to horizon in display of nature that I can only describe as truly breathtaking. Not much beats snow covered mountain peaks rising straight out of the sea with auroras filling the night sky overhead. For me, the Lofoten Islands are worth the risk of bad weather to take images of the northern lights that are dynamic and powerful. Something more than just a boring snow field or barren forest in the foreground. There is no switch to turn on the northern lights. Seeing them primarily depends on a combination of four main elements: darkness, clear skies, extreme northern (southern) latitude, and solar activity. 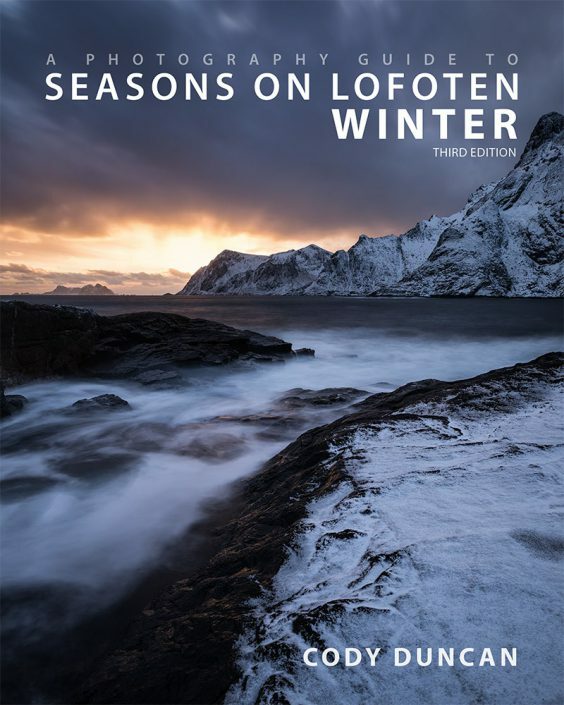 Winter on Lofoten already covers two of these elements: darkness and northern latitude. Clear skies and solar activity are more or less left up to chance. I have experienced some winters where I rarely saw a star over a two week period due to heavy cloud cover, yet elsewhere in the north clear skies brought fantastic aurora displays. Other years I have had multiple clear nights and yet the sky remained silent. Like the weather, there is no way to predict what you will get until you are on the Islands and the twilight is fading into night. In general, there is a short term level of predictability for the occurrence of auroras, as they usually happen several days after a solar storm. Several websites and apps are available to help forecast the appearance of the northern lights up to about 3-4 days out. Though in my experience, they often appear when they feel like appearing. Some of the best displays I have seen were on forecasted low activity nights, whereas some nights which were predicted to have hight activity were quiet. If I am to give some advice though, I would use the prediction of solar activity level to calculate how much effort you want to put into finding clear skies, should they not exist at your current location. With low intensity auroras, a faint, almost cloud like glow will appear in the night sky. Barely perceptible to the eye, if you pull out your camera and make an exposure of several minutes, you will see the light is green. When the northern lights are strong, the green color will be readily visible to the naked eye and if your lucky, reds and pinks might also appear. On these nights, you really know you’re seeing the northern lights as they swiftly move across the sky. Historically, March and October typically have the greatest occurrence of solar activity. And while there is sufficient darkness by late afternoon during winter, I find the northern lights don’t typically appear until 20:00 – 21:00 or later. Generally, the earlier in the evening they appear, the stronger the display, but this is not always true. If you haven’t seen anything by midnight, then they are probably not going to occur. Photographing the northern lights on Lofoten can be both a rewarding and frustrating experience. While the dramatic landscapes and coastlines of Lofoten provide near limitless compositional opportunities, the equally dramatic winter weather can leave you longing for even an hour of clear skies. 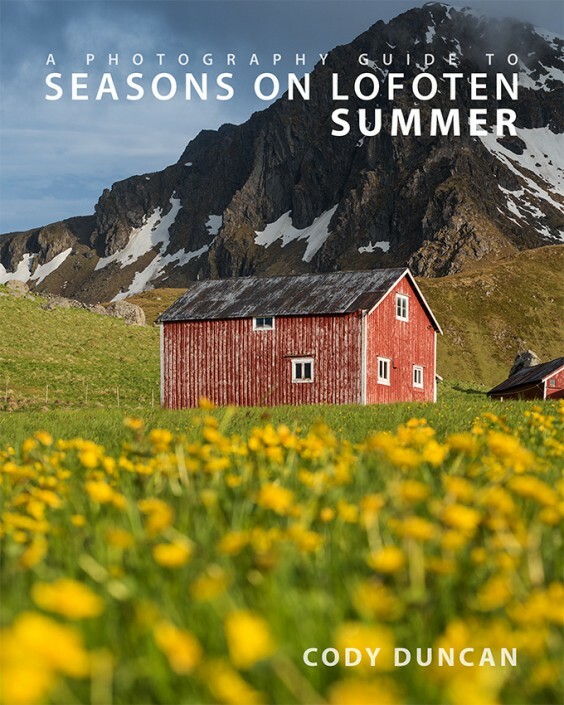 If the northern lights are your main purpose of traveling to Lofoten, then it’s possible you’ll be left disappointed when the sky remains stormy for a the duration of your visit. Rather, I like to think of any appearance of the lights as an added bonus to what is already a world class landscape. The coastal areas of Lofoten are often the best locations for shooting the northern lights. That being said, there are a few things to keep in mind. First, most Islanders live near the coastline. This means that you should be aware of light pollution, even on seemingly distant shorelines. Next, pay attention to how open the horizon is from the northwest to the northeast, as this is typically where the aurora will appear. If you have mountains rising too steeply in front of you, then any low level auroras may be blocked from sight. The dramatic rising peaks across the fjord from Reine are one of my favorite aurora locations. The mountains rise steeply from the fjord providing a dramatic setting to the scene, yet are far enough away so as not to block most aurora displays. Additionally, there is easy access to a multitude of shooting directions, allowing for compositional flexibility, depending on where the auroras are appearing in the sky. Even driving a few minutes down the road can provide an entirely different looking group of images set against one of Lofoten’s most iconic mountain peaks. The beaches of Flakstadøy and Vestvågøy are some of the most popular and photogenic locations for shooting the northern lights. Haukland, Vik and Utakleiv beaches, only separated by a short section of road, all face in slightly different directions, letting you move between them as the northern lights move though the sky. Skagsanden beach provides a wide open northern horizon which works well with aurora appearing from multiple directions. The northern coast of Gimsøy also has some small beaches and wide open horizon, but they typically lack any mountains in the background. 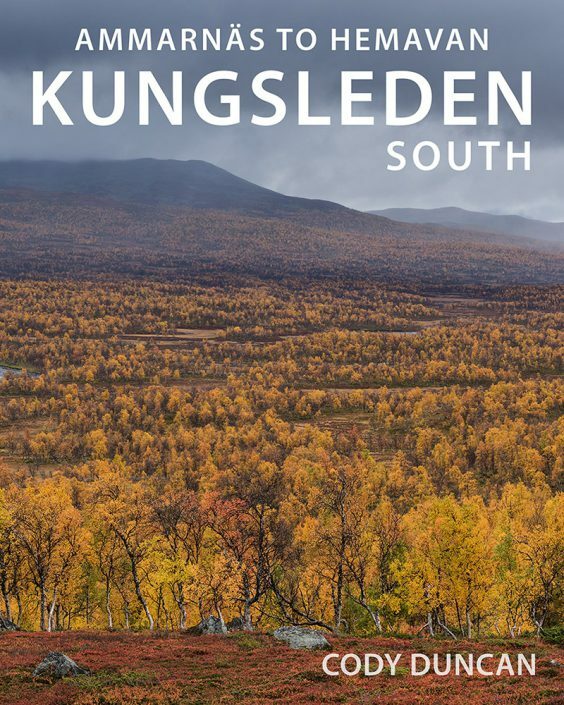 Getting away from the coast, there are also multiple inland options for shooting the northern lights. But these typically are more dependent on localized conditions, i.e.. how much snow is on the ground, and often require a bit more planning and exploration to find a scenic composition. Additionally, mountains can also block a majority of the horizon, limiting the viewing angles the aurora may appear in. 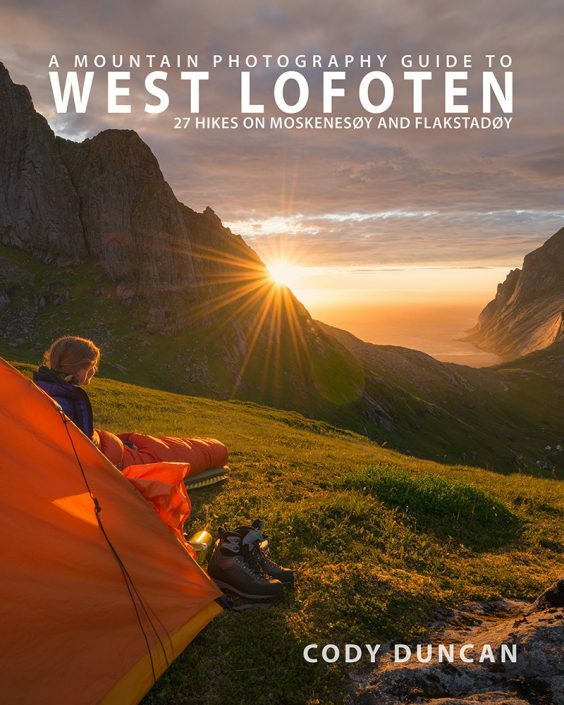 While the northern lights can be photographed more or less anywhere across Lofoten, the list below highlights some of the better locations across the Islands with good possibilities for both composition of the foreground in combination with northern lights overhead. On good nights, when the aurora are moving about, I suggest visiting several locations vs. remain in one place the whole evening. If possible, I would also suggest to scout any location you’re thinking of during the daylight, so you at least have some familiarity of where to go in the darkness as you’re rushing to take a shot. Reine: A multitude of views possible, from the tourist viewpoint over the harbor to include the city, to areas down on the fjord to avoid any lights in the foreground. A good variety of shooting angles are possible from northwest into the back of the fjord, to directly east across the open waters of the Vestfjord. Though the mountains rising on the north side of the fjord are some of the most dramatic on Lofoten, they will suffer from severe light pollution with anything less than a quarter moon, taking on an ugly orange color cast. Hamnøy: One of the most popular locations on Lofoten due to the fact that many photographers stay at the Elliassen Rorbu, so you don’t have to go much past the front door. With the auroras shining overhead, you will be bumping tripods with dozens of other photographers here. You can find a bit more space if you walk a few hundred meters to Toppøy. Same as above, the peaks across the fjord suffer from light pollution with anything less than a quarter moon. 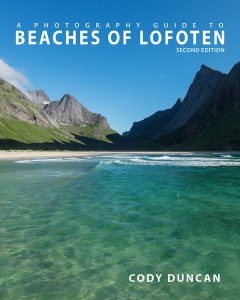 Skagsanden beach: This beach has grown in popularity recently as it is the first nice beach reached from the Reine area where most of the photo workshops stay. The beach faces northwest, with good open skies continuing to the north. With some nice rocky areas on the side of the beach, a variety of compositions are possible here. Uttakleiv beach: Another of the more popular beaches, the classic Uttakleiv view with northern lights overhead is a coveted one among photographers. Sky is open from the northwest to north. Any aurora from a more easterly direction will be mostly blocked by the massive Himmeltindan. Light pollution not too bad, but a bit of moonlight helps with the scenic foreground here. Haukland beach: Facing south west, with mountains directly north and east, Haukland works best in strong aurora displays when the lights are well overhead or have swung around to a more southern or western direction. Vik beach: Similar to Haukland, but more open to the north, I often start my wait for aurora here as the horizon is fairly visible. With Uttakleiv and Haukland just down the road, Vik also works well with shifting auroras if you need to change locations quickly. Unstad beach: While Unstad is one of the more scenic beaches on Lofoten, it unfortunately has quite limited angles in which the northern lights need to appear, making Unstad a bit of a gamble. Best to save Unstad until after you have been to several other locations and have some good shots. Minor light pollution, but like Uttakleiv, some moonlight is beneficial for the rocky foreground. The first initial aurora of the night can sometimes be nearly identical to a cloud in appearance, especially if the sky is already partly cloudy. Take out your camera and do a quick exposure: if the cloud is green, then you have northern lights. If the cloud is orange or white or any other color, its just a cloud. If the moon is out, use that to focus on, as it will be the brightest object in the sky. If there’s no moon, then try and find some distant city lights to focus on. If this is also not an option, then do your best to focus manually on the stars. Take a test shot to check your focus, as fine tune if necessary. With the high ISOs of todays cameras, I like to stop down 2/3 of a stop, just for a little better edge to edge sharpness on any foreground elements. While shooting in manual mode, you do need to take some care of the intensity of the aurora. It is easy for a dim display to suddenly double or triple in brightness within a few short moments, blowing out your exposure if you don’t compensate. When photographing the northern lights, be sure to check your exposure with the histogram, not just visually. As your eyes adjust to the dark, your camera screen will begin to appear artificially bright. Without referencing the histogram for exposure, you might return to your room and suddenly find you have a bunch of underexposed images. While often advised to photograph the northern lights without the influence of moonlight, I am of the opposite opinion and think that the addition of moonlight greatly benefits the scene. Moonlight will only influence the weakest displays of auroras, and to be frank, these dark, faint displays aren’t that spectacular to photograph. When you see a good aurora, you will know it, and moonlight will have no effect on this. Without moonlight, most of the landscape from foreground to distant mountain peaks will be overly dark, or worse, glow bright orange due to light pollution – one of the reasons you might notice many colorless, black and white looking mountains as people attempt to remove the ugly color cast. Many might shoot multiple exposures and combine them later, but I think the added light from the moon, so you can see shadows on the mountains, helps add depth to the scene and better balance to the elements of land and sky. When the northern lights are dynamic and quickly moving, you will want to use as fast of shutter speed as possible to better capture the shape and form of the lights. Depending on how wide you are shooting, I generally try and keep exposures under 15 seconds, and ideally, under 10 seconds. When the lights are faint and amorphous, and particularly if there are some clouds swirling over the mountain peaks, it can be useful to stop down and open up the shutter for some long exposures to let the movement of the clouds better balance with the auroras for a more subtle look to the scene. Sept – Oct 2011, 2 weeks. Generally stormy conditions with few clear nights. Some faint displays on several nights between passing clouds. Oct 8th, the sky finally remained clear and my 2nd best Aurora display filled the sky for over an hour. Feb 2012, 2 weeks. I only experienced clear conditions on two nights, one of them producing only a small aurora display. Had I waited another week, then I would have witnessed one of the most powerful displays of the year. Aug – Sept 2012, 2 weeks. Some small, mild glows in the sky, but nothing worth pulling out the camera for, even with a multitude of clear nights. I missed a good display just before I arrived. Sept – Oct 2012, 2 weeks. Some clear nights, but little activity. Until the night of October 8th (again! ), a perfectly clear sky and Auroras from horizon to horizon as I was sailing across the Vestfjord on the Hurtigruten. Even at 5:00 am as I was walking to the airport in Bodø, the sky was still active. Feb 2013, 2 weeks. 3 good Aurora displays during the first week: Feb 14, 18, 19. Every night in which the sky was clear. During the following 10 days, the weather deteriorated and there were no clear skies or Auroras until the 28th when I was on the Hurtigruten ferry to Bodø and the weather cleared briefly. Sept 2013, 3 weeks. Many clear and calm nights, but the Auroras remained fairly elusive. The best night was September 12th, while I was over in Sweden, but due to dropping my camera in a lake, there are no images. Despite clear weather from September 24 – 30, only one night of auroras. Feb – Mar 2014, 6 weeks. I photographed the northern lights on 3 nights, all in the 1st half of February. There were some other nights of auroras, but either they weren’t worth photographing, or the sky was too cloudy. I did miss a good night on Lofoten while I was in Abisko, Sweden, where, unusually, it was clear skies over Lofoten and snowing in Abisko. Go figure. Aug – Sept 2014, 5 weeks. Autumn 2014 was fantastic! Perhaps the most numerous and longest lasting northern lights I have seen. Almost like clockwork, 2-3 nights per week the sky was both clear and filled with northern lights. The first night I saw them was on August 28th, with the sky not yet fully dark. By mid September, I was routinely staying up till 1:00 – 2:00 am shooting. Jan – Feb 2015, 6 weeks. This trip started off good with 3 consecutive nights of moderately bright auroras and calm conditions during the first week, unfortunately, this also coincided with a new moon. The best night of the trip was Jan 31, with brights auroras lasting for hours and a near full moon and calm winds. As February arrived, so did the wind and clouds. There were a few more interspersed nights of northern lights, though nothing spectacular as most of the month was ruled by poor weather.